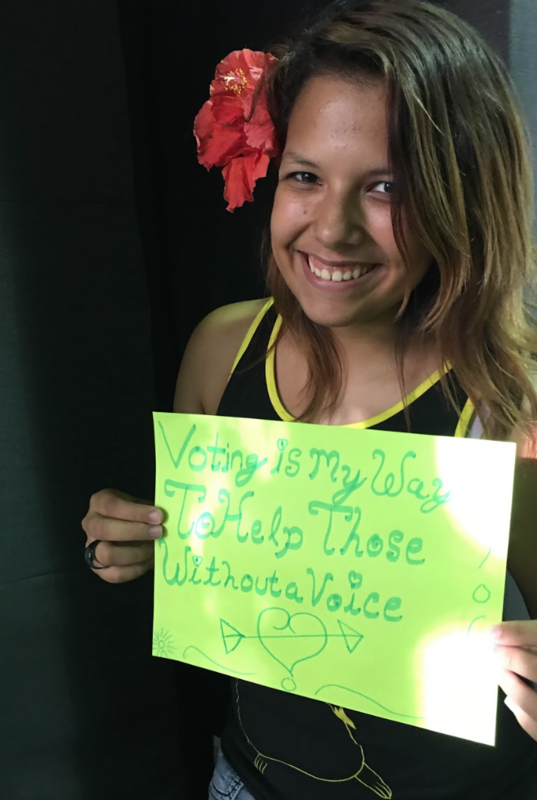 Even though I am not allowed to vote in elections because of my age, getting out the vote is the most important thing I can do to raise my voice as a young person of color. Getting out the vote is bigger than anyone can imagine. The more we get out the vote, the more we are heard and seen. 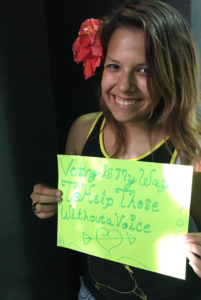 Youth of color may not realize that their voices and votes really do matter. However, increasing our voter turnout shows that we do care what happens in our communities and that we have a say in our future. This is why I am committed to mobilize 1000 voters through CFJ’s #IAm1000Votes Campaign this fall. Young people of color are always told that we don’t know what is happening around us. I was told that I wouldn’t be able to make a change for myself or other people around me. But I feel voting gives me the freedom to prove them otherwise. One vote can always make a difference. Many people don’t get the chance to vote since they don’t have legal status or they aren’t citizens. My mother and sister are not allowed to vote. Despite living here for decades, they never get the opportunity to vote and improve their quality of life. That’s why young voters of color need to vote. People of color are the majority of the population in California. However, most youth of color find it difficult to vote because work, school, and other priorities come first. But also voting information, like the propositions and how they impact communities, is not reaching them in a way that speaks to them. In a way, elections are set up in a way so that we don’t go vote. We are convinced that our votes don’t matter, therefore, we uphold the stereotype that we don’t care. But if young voters of color aren’t turning out to vote, then who is going to help us get our voices and opinions to matter during elections? Elections involve the most crucial things that impact youth of color directly, like healthcare, school funding, better food options, recreational programs, and most of all, fixing the environment we live in, such as our housing conditions, our streets, and community safety. Can we continue to stand on the sidelines while others vote for us? Communities continue to fall apart with everything happening around us. More young people of color, especially young black men, are sent to prison. There’s no justice for victims. School suspensions of youth of color continue to go up. Indigenous rights to their land and sovereignty are ignored. A vote is a tactic that can help out a movement and make a city more inclusive of its residents. A vote can keep more people out of prison and help them get somewhere in life rather than given a path to nowhere. A vote can keep a child in school and art programs open. The life at my art school, Renaissance High School of the Arts in Long Beach, has kept me out of serious trouble because I was able to find things I was passionate about. Dance and music have helped me use my energy into something more proactive rather than destructive. Without these programs, I would be in a different place in my life. That’s why voting matters, because our votes can either sustain or eliminate these vital programs. With everything going on in our communities, this is why I’m fighting to get out the vote to get out the vote. My call to action to you as a young voter of color is: inspire those around you to vote and make a change! Please join Yaritza in signing the pledge to vote this November 8th!